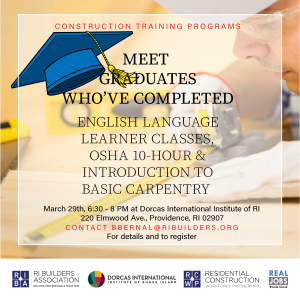 If you are hiring for entry level positions in carpentry/construction, you won’t want to miss this opportunity to meet candidates who have completed a 12 Week, 115 hour, Vocational English Language Learner Training Program, are bilingual or multilingual, are citizens, or authorized to work in the US, have OSHA-10 Certification, and have learned the skills to gain entry-level work in Residential Construction through a Real Jobs RI Grant. Join us on March 29th from 6:30 – 8 PM at Dorcas International Institute of Rhode Island, 220 Elmwood Avenue, Providence, RI 02907. Please RSVP to Betty Bernal, bbernal@ribuilders.org with your company name, position(s) hiring for, and your attendees. We plan to offer this training program again in late April, if you are interested in sending a candidate you want to hire or send an employee to gain more skills or increase their English Language, contact Betty Bernal for more information.